Metro North Hospital and Health Service is committed to a culture of innovation. We recognise that staff, and our health care partners, have great ideas to help improve outcomes for patients, through new processes, resources and partnerships. In recognition of our need for innovation, MNHHS has committed $1 million to fund projects jointly created between MNHHS and its partner organisations (LINK) and $1.1 million to fund projects developed by staff within MNHHS (SEED). LINK funding provides the opportunity to build partnerships and community engagement capability, deliver efficiencies and improve continuity and quality of care for patients. The SEED program is accessible to inspirational and creative staff to find new and improved ways of delivering health services for the benefit of our patients. SEED funding is only available for Metro North Hospital and Health Service staff. You have an idea. Now you need to fund it. So how do you apply and what is the process for selection? LINK must have a partnership between MNHHS and an external partner. Is there a minimum or maximum amount to apply for? Each year funding up to $2.1 million is available for LINK and SEED Innovations (i.e. LINK has $1 million and SEED has $1.1 million). 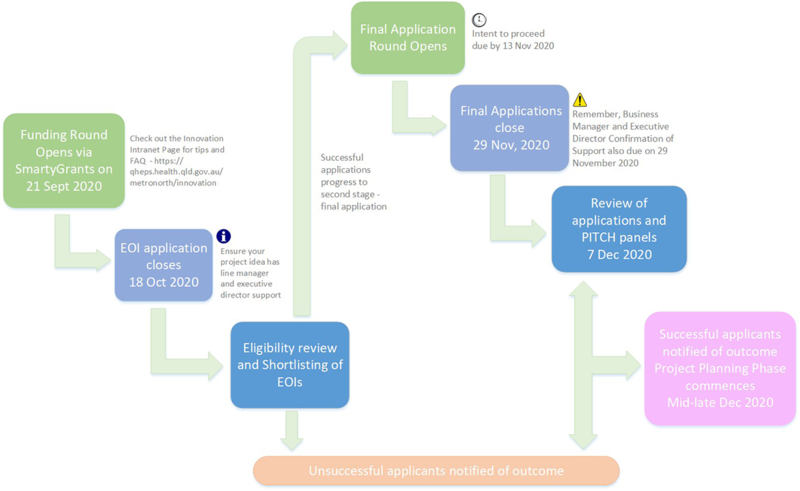 You can apply for as little or as much as your project requires, however MNHHS aim to fund as many projects for both programmes as possible, so projects asking for a large portion of this funding may be asked to consider how they may minimise their request in order to proceed for consideration. Can I submit my application to both SEED and LINK? No you may only submit to an application for one form of funding. How long is the selection process? Approximately 2 months to allow time for review of all applications. Why is it 2 months? Because applications go through 2 stages of review. When would we find out if we were successful? The selection process should be completed and successful applicant notified by November each year. All successful project should plan to commence in May of the following year, for e.g. 2018/19 Projects will commence May 2019. For how long is a project funded? All successful projects have an Executive Sponsor from the Operational Leadership Team. Their role is to advocate for projects to continue as Business as Usual or be developed further. You have an idea but is it innovative? What is new about it? What are the benefits of your project to MNHHS? Have you done your homework? Who else might be doing this in the Health Service? Have you checked the relevant literature? Try and include other people/services/facilities in your project, if that is relevant. Why struggle alone if others are interested in helping or solving the same problem. Think your project through – who should be involved? What resources do you need? Have you got the capacity to undertake a project? Have you got your manager/department/Executive support? Will you be able to measure the outcomes of your project to show it has made a difference? Properly cost your project – talk to your business manager. Use the costing template. Do you have an IT component to your project – if so have a chat with MNHHS IT department (contact us) for advice. You may need to include these costs in your budget.